We’d love your help. Let us know what’s wrong with this preview of Pension Dumping by Fran Hawthorne. Fran Hawthorne, author of Pension Dumping, is a recipient of the New York State Society of Certified Public Accountants award for Excellence in Financial Journalism for 2009--the first year books have been honored. Pension plans in America no longer represent commitments that financially troubled companies will honor. Neither bankruptcy courts, nor Washington, nor unions h Fran Hawthorne, author of Pension Dumping, is a recipient of the New York State Society of Certified Public Accountants award for Excellence in Financial Journalism for 2009--the first year books have been honored. Pension plans in America no longer represent commitments that financially troubled companies will honor. Neither bankruptcy courts, nor Washington, nor unions have the clout to make them do so. The disposition of these plans is instead left to serve the needs of big investors. Often these investors are a failing company's best hope of restructuring after bankruptcy. Investors want a lean investment unburdened with financial promises to employees no longer on the payroll. Despite laws passed to discourage the termination of plans, the courts allow it, caving in to the forces garnered to reinvigorate a failing company. Unions are often compelled to choose between the financial welfare of retirees and jobs for active workers. 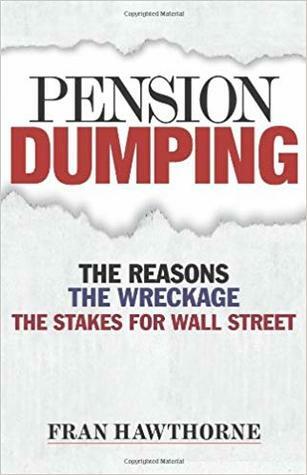 Pension Dumping explains in shocking detail how terminating the pension plan became a knee-jerk strategy for bankrupt companies that hope to attract big investors to help them reorganize. To ask other readers questions about Pension Dumping, please sign up.